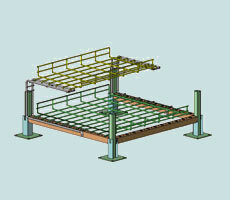 Access flooring cable tray systems. The smarter way to build computer rooms & smart office buildings. Designed, patented and engineered with innovative features and benefits that provide extremely efficient cable management while significantly lowering your life-cycle costs, the ACT/FloorFlex System is the right choice for data center, electrical room and office application. By making full use of standard grid spacing, the system is so flexible that it can be installed or retro-fitted without conflict into the access floor structure itself. Cable Trays can be located just inches below the finished floor for easy access, so making changes or repairs isn’t a back breaking, time consuming job. Create organized cable channels with Cable Tray Dividers without having to use tie wrap to keep them together. This greatly reduces the time spent replacing, moving or adding new cables and lowers the life-cycle costs at the same time. Because the system is based on 24” and 48” modules, it has the strength and versatility to be ramped up or down beneath the finished floor surface by simply adjusting the height of the vertical supports. For multi-level applications, the system can also be installed in a stacked or parallel configuration. Constructed carefully of solid, high-quality materials, the ACT/FloorFlex System answers all your cable management needs-while giving you maximum flexibility and accessibility in the future. We are proud to be Made in USA and an approved GSA manufacturer. For additional information, please click on this link. Copyright 2010. All Rights Reserved Access Cale Trays.